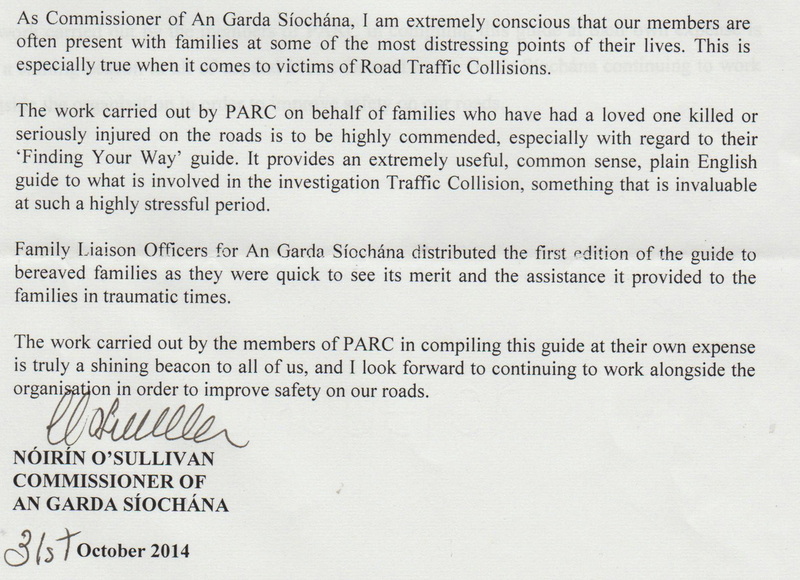 'Finding Your Way' - a guide for families of road traffic victims. "After the death of our beloved Brian in a Road Traffic Collision, we started looking for answers. We would like to express our sincere thanks to all at PARC. The booklet PARC created "Finding Your Way" has been a great source of practical information at a time in our lives when we did not know where to turn . The support and assistance we have received from PARC has been invaluable." 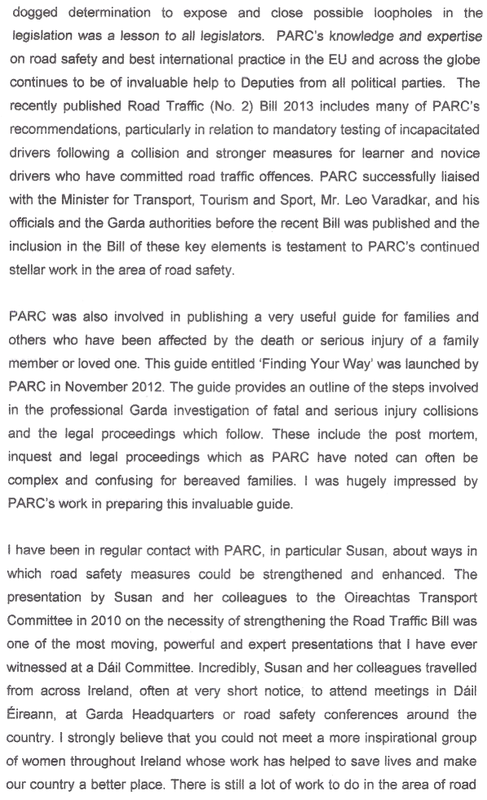 “Following the tragic deaths of Geraldine and Louise in a road traffic collision, we were given the PARC Road Safety Group’s "Finding Your Way" booklet by our Garda Family Liaison Officer. The booklet is a fantastic resource which explains the complexities of the legal system surrounding road traffic collisions in a simple to understand format. The booklet guided us through what was an extremely overwhelming and confusing time. 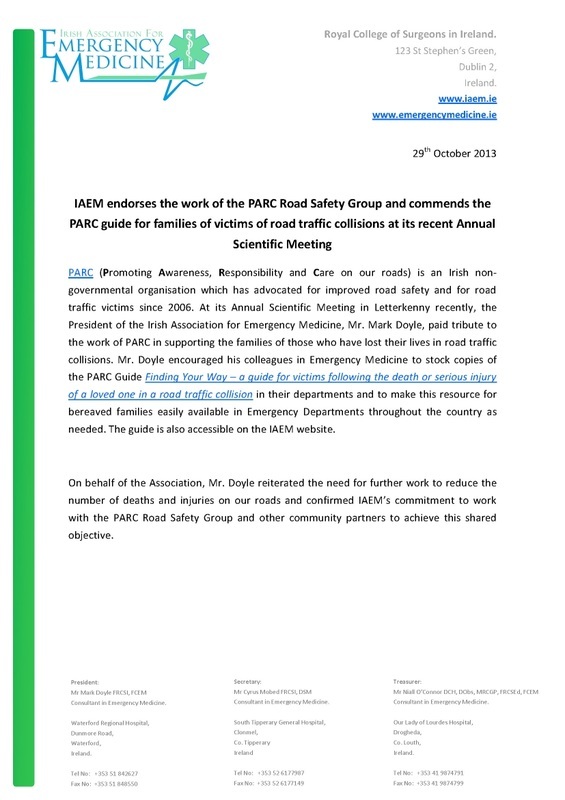 We can't thank PARC Road Safety Group enough for their support and guidance. Through their hard work and lobbying, they assisted us in our successful efforts to change the laws regarding car owners who knowingly allow their car to be driven by an unaccompanied learner driver. This change in law is estimated to save 15 lives a year. “In the days following our son Karl Robertson’s death in 2017, our Garda Liaison Officer gave us a booklet called “Finding Your Way” from the organisation PARC. This booklet was invaluable to our family. This was a whole new world to us and we didn’t understand anything that was happening with regards to the investigation and we didn’t know what to expect. Anytime any of us had a thought or question regarding anything to do with the investigation, we would go straight to the book and always find an answer, or it would guide us in the right direction. Tony, Cathy Niamh and our extended family would like to thank PARC for all you have done for us, following the death of our beautiful Karl. PARC have been a tower of strength to us and we are eternally grateful to you”.
" Finding Your Way has been an excellent guide for our family. It gave us a very good insight following the death of Paul aged 16 due to a traffic collision. In our opinion this booklet should be given to everyone caught up in these circumstances. Forever grateful, Paul's Grandmother, Families, Dublin Northside".
" The Finding Your Way booklet allows you to have an understanding of procedures to a situation you wish had never happened, but the assistance given goes some way to dealing with a bureaucratic process, an extremely useful read,"
"I just wanted to send my thanks to you for forwarding your booklet to me. I must say it is so heartening to see how you have managed to turn a personal tragedy into a way to benefit others by researching and publishing what I'm sure must be a Godsend to many people caught up in a terrible situation. It put me in mind of the saying that "We cant direct the wind, but we can adjust the sails. For maximum happiness, peace and contentment, may we choose a positive attitude." You are an example to us all. Again my thanks. 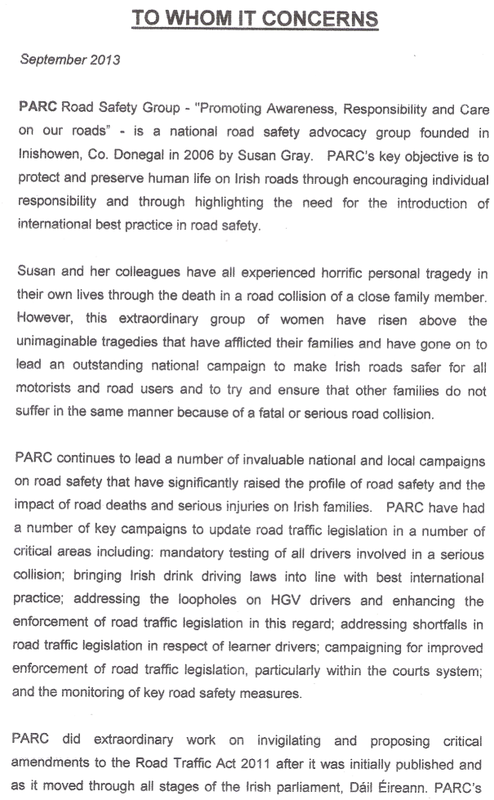 “PARC’s commitment to road safety and their advocacy and support for individuals bereaved and injured by collisions on our roads is to be applauded. Their dedication is evidenced in the production and publication of ‘Finding Your Way’, an invaluable information source and practical guide for people who have found themselves affected by a road traffic collision. ‘Finding Your Way’ outlines what is involved in the investigation of fatal and serious injury collisions and the legal proceedings which follow. By doing so it seeks to ease the burden on families devastated by such collisions, and I welcome its distribution by Garda Family Liaison Officers, as part of the assistance they provide. “I wish to commend PARC for undertaking the extensive work involved in putting together Finding Your Way. This new edition expands on and updates the information provided in previous versions. It is exactly the kind of practical information that people need at very sensitive and vulnerable periods of their lives when they have lost loved ones through road collisions. I’m sure the pain at those times is sufficient burden to bear without having the trouble of finding out where to turn for advice and direction on the practical matters that need to be addressed. “We all know about the human cost of serious injuries or death on families and on society. But every serious incident also has a significant impact on our medical system. Every collision has the potential to involve the National Ambulance Service, one or more Emergency Departments, and numerous medical staff. It may require immediate surgical intervention, or many years of rehabilitation. There is also the mental health impact on survivors, or the families of the bereaved. I took a very close interest in road safety during my term as Minister for Transport, Tourism & Sport and was in regular contact with Susan Gray and PARC. I can say confidently that PARC is one of the most effective lobby groups in the country, and certainly one of the most important. Susan and her colleagues work tirelessly to raise road safety awareness, improve standards and close loopholes in legislation. Most recently, the group's volunteers took time out to monitor judicial practices in courtrooms across Ireland. This new 'Finding Your Way' document is typical of the valuable work conducted by PARC. It will be a great help to anyone unfortunate enough to experience a road traffic collision. It's a fine example of the high standard of work and selfless commitment of PARC. 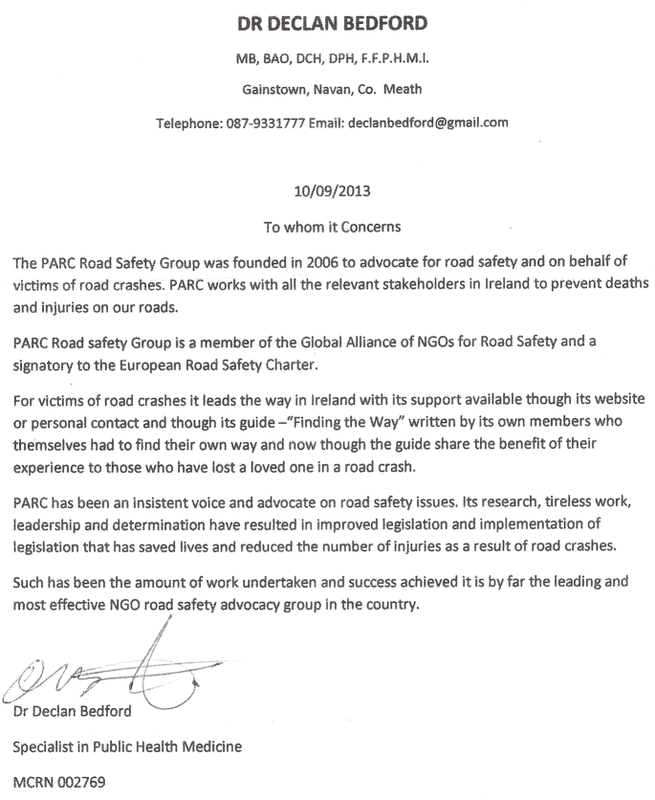 "PARC is a not for profit Road Safety Advocacy group providing support services for those affected by road traffic collisions in Ireland. PARC through its membership provides sympathetic counsel to those families who have lost loved ones and are attempting to navigate through the personal, social and legal consequences of a road traffic death. PARC have put together an excellent booklet ‘Finding Your Way – A guide for families of victims following the death or serious injury of a loved one in a road traffic collision’ which provides the reader with valuable information that has been put together by those who have themselves been touched personally by the loss of a loved one so tragically on the road". “As a Nation, Irish people have made great strides in reducing the number of deaths and serious injuries on the roads. Please remember that behind each number are real people - people whose life may have ended, or have been badly broken. And, I would like to dwell for a few moments, if I may, on those broken lives - the lives of people who have been left behind or those who have experienced the devastation of a crash, and survived, and who must go on living. The first shocking impact never ends for the individuals themselves, their families, their carers and the communities around them. because of a fatal or serious road collision. PARC continues to lead a number of invaluable national and local campaigns on road safety that have significantly raised the profile of road safety and the impact of road deaths and serious injuries on Irish families, including the development of the very useful guide for families of victims of road traffic collisions entitled ‘Finding Your Way’. The guide provides an outline of the steps involved in the professional Garda investigation of fatal and serious injury collisions and the legal proceedings which follow. These include the post mortem, inquest and legal proceedings which as PARC have noted can often be complex and confusing for bereaved families. I was hugely impressed by PARC’s work in preparing this invaluable guide. “PARC Road Safety Group is a non- governmental voluntary organisation which advocates for improved road safety policies and provides support for road victims and their families. Typical of their understanding of the needs of those who have lost a loved one and their attention to detail is their guide ‘Finding Your Way’ which provides guidance to families who have lost a family member as a result of a car crash or had a family member seriously injured. PARC members had to find their own way and now through their guide share the benefit of their experience to help others who have lost a loved one in a car crash. The guide is written in plain English and a style that makes it very understandable. It provides an outline of the steps involved in the Garda investigation, the post mortem, the inquest and the court cases. “This booklet explains the role of the Garda Family Liaison Officer during the investigation of a fatal road traffic collision in a clear and informative way. Copies of ‘Finding Your Way’ are given to each Family Liaison Officer (FLO) and each Family Liaison Coordinator (FLC) during training. - Speech by Minister for Transport Leo Varadkar at the Road Safety Authority International Conference on Driver Distraction in Dublin Castle on Thursday 20th March 2014. "This morning, I would like to take this opportunity to acknowledge the essential work done by rank-and-file members of Gardaí in enforcing the law on our roads. In addition, we should remember the vital role of the Medical Bureau of Road Safety in the battle against intoxicated driving. The Road Safety Authority has, of course, played a central role in the many improvements in road safety over the past seven years since its foundation. I would like to welcome Moyagh Murdock to her role as new Chief Executive. There are few State agencies which can measure their success in terms of lives saved, and the dramatic decline in road deaths in the past seven years is something in which the staff of the RSA can rightly take pride. I know that the RSA, under Moyagh’s guidance, will continue to build, in the coming years, on the considerable work done to date. 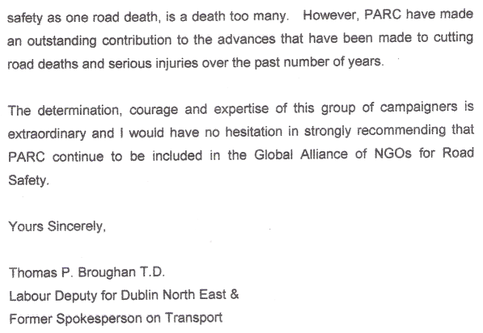 I also want to acknowledge the work of the campaign groups who focus on road safety such as PARC. Road Safety would not get the priority it does without them." 2 July 2014 -Minister for Transport Leo Varadkar on RTE Sean O Rourke programme.
" We had, for the first time, a meeting involving me, my officials, Frances Fitzgerald and her officials and the main group that campaigns for road safety and that's the PARC group that you may be aware of- which are largely a group of people who have lost loved ones on the road. They are very vigilant people - they really are a huge asset I think, in terms of road safety and they keep an eye on what's going on and they even go into the courts and see what's happening in the courts and things like that. We had a joint meeting with them which I think was very useful because so many issues that affect road safety is actually as much a justice issue as it is a Transport issue."